Over the summer my family got really lax on staying on top of chores and I realized I desperately needed a new system, so I was thrilled to review The Everyday Family Chore System from Everyday Homemaking. This 88 page digital download helped walk me through not only designing a system that works for us, but also making sure I’m teaching my girls important life skills as soon as they’re ready, too. It also includes printable instruction cards for your kids to review before they complete a chore so they can remember exactly what is expected. The book also talks a lot about tying “love-strings” to your kids hearts, which is just awesome. In the middle of a book about training your kids to clean their rooms and load the dishwasher, you’re reminded to do things with your kids. Laugh with them. Smile. Speak to them gently. Love them. It’s a timely reminder, because when working on all the other things, like reminding my kid for the umpteenth time to put her clothes in the laundry hamper, not two inches away from it on the floor, I just want to pull my hair out, not speak gently, lol. What honestly stood out the most to me, though, was the emphasis on not just assigning chores, but taking the time to thoroughly instruct your kids on how to do them properly. This might mean first having a kid watch you load the dishwasher explaining what you’re doing for a few days, and then transitioning to having your kid load it while you watch and help for awhile before she’s ready to do it independently. I think one of my downfalls before with trying to have my kids begin to take over certain chores is that in the short term, it’s actually more work for me, and takes longer and I’ve lost sight of the end-game and gone back to just doing it myself. I think the age on successfully putting dirty clothes in the hamper may be somewhere around forty, but for everything else there’s a light at the end of the tunnel. 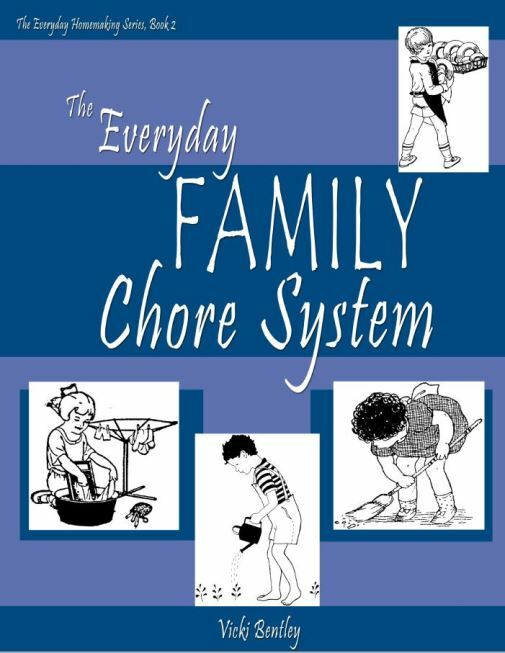 Be sure to check out what others think of The Everyday Family Chore System as well as the Everyday Cooking cookbook which is also by Everyday Homemaking by hopping over to the Homeschool Review Crew link-up. Your review made me laugh — I appreciated the humor! 🙂 So glad the book inspired you in a few areas. I’d love to hear more about the tweaks you needed to make to the how-to-do-it cards…and of course, that’s why there are blank cards included (and they are 3×5, so easy to adapt even using index cards) — hopefully the pre-done cards gave you a starting point. Thanks so much for your thoughtful review.